The Turks are a society devoted to their traditions, and this extends to their dress. Şalvar (trousers), inner robes, and kaftan (outer gown or robe) they wore in Central Asia came to Anatolia with the Seljuks (1037-1157) and continued to be worn by the Ottomans. The range of dress worn by the Anatolian Seljuks is revealed through the miniatures and ceramics of the period. The most striking aspects of Seljuks’ dress are the V shape of the neck opening and the decoration of the seam of the outer kaftan where the arm joins the body. This seam normally has a narrow, inscribed band on it known as a tiraz. As time passed, the Ottomans introduced changes to this style of dress that resulted in greater variety. In the Topkapı Palace Museum in Istanbul, there is a very rich collection of Ottoman garments. There are more than 1500 varieties of clothing from outer gowns to socks. There are also women’s and children’s clothing in the palace collection. Among the earliest examples in the Topkapı Palace costume collection are two fur-lined outer garments made of dark brownish-green and red broadcloth with V necklines; slightly longer than jacket length, one has long sleeves, and the other has short sleeves. The fur lining have been turned to the exterior at the collar, front, and sleeve openings. These garments display a strong Seljuk influence. They are registered as kazaki in the palace’s early registers. This term also appears in the work of the Italian traveler Luigi Bassano da Zara, who visited Istanbul in 1545 and presented the first Western information about Turkish dress. It appears that kazakis continued to be used throughout the early eras of the empire, but then both the term and the garment vanished. However, other garments, known as kaba and cübbe (long gowns, with a diagonal opening down the front, often kept in place with a sash or cummerbund), were used by the Seljuks, and these continued to be worn until the end of the Ottoman Empire. In the sixteenth century when the Ottomans were at the peak of their economic and political power, the arts also reached a turning point. The textile industry shared in this wealth: the development of weaving reached a pinnacle with the addition of gold and silver metallic threads (or gold or silver plated threads) to silk textiles. The Ottoman sultans placed great importance on their garments and wore robes and kaftans sewn of the most expensive and luxurious fabrics. Their taste for luxury and superior-quality materials significantly influenced the development of Ottoman textile weaving. The designs for the fabrics used for court apparel and furnishings were created at special workshops in the palace by court designers known as hassa nakkaşları. Because the palace workshops were unable to meet the demand, orders were also given to workshops in Bursa and Istanbul. Both those fabrics that were woven for the palace and those for the general public, particularly the silk fabrics, were subject to stringent control by the state. Details about the number of warp threads, their weight, length, twist, and dye were established and communicated to the relevant artisans via municipal codes. After the fabric was woven, it was sent to a fabric-quality inspector (arşıncı), who examined the cloth; if the width, length, and weaving standards were approved, the cloth was stamped and released to the market. The splendid garments of the sultans were made of various fabrics woven in these workshops, including heavy silks such as kemha (brocade), kadife (velvet), çatma (brocaded velvet), seraser (a precious silk fabric woven with threads of gold and silver), diba (a silk brocade), satin, and silk lampas, lighter silks such as taffeta, canfes (fine taffeta), and vala (a gauze like fabric); woolens (broadcloth), mohair, and cashmere; and a variety of cotton fabrics. Cloth was also ordered from the renowned weaving centers of the West- notably, those in Italy, such as Venice, Genoa, and Florence. In addition, a great deal of fabric and many garments arrived as both commercial products and diplomatic gifts from countries such as Iran, India, and China, all of which were famous for their production of silk textiles. The term nakkaşhane derived from the Persian word “naqsha”; both mean a “pattern” or “design.” One of the most famous of these designs is the Chintamani motif, composed of three-ball and a wavy line. 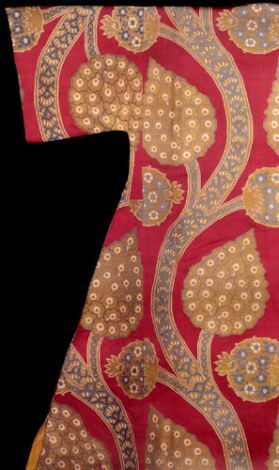 Early Turkish fabrics also frequently display motifs employed in Chinese art, including floral motifs such as Hatayi (flowers in profile) and lotus, spiraling branches with tiny leaves, the Chinese cloud motif, and the endless knot motif. Another motif often used for the sultans’ kaftans was the crown, which was adopted from Western-and particularly Italian-weaving and interpreted according to Ottoman taste. The crown motif, an appropriate royal image, was very carefully worked, although it was generally used only as a connecting motif in the primary design scheme. Celestial motifs such as the sun, moon, stars, and clouds, which were also well suited to the imperial image, can be found in court fabrics. The inclusion of Tabriz into the Ottoman Empire in 1514 resulted in the arrival at the Ottoman court of various renowned Tabrizi designers. They were responsible for a new age of Ottoman book ornamentation characterized by the use of stylized composite blossoms of Far Eastern origin, known as the saz style. The new saz forms included flowers depicted at different angles and combined with twisting and turning serrated leaves with pointed tips. Saz designs soon began to appear in a wide range of textiles. Floral designs in the saz style became a feature of palace design workshops. Such designs have the appearance of thick reeds, with flowers surrounded by large, serrated, dagger-shaped leaves. The characteristic of this style is the naturalistic representation of the flowers of paradise, such as the blossoms of the rose, tulip, carnation, hyacinth, lily, and jonquil, as well as flowering spring branches. These flowers, identified with the garden of paradise, became the central motifs embellishing court kaftans of the classical period after the reign of Sultan Süleyman I.
Kaftan is the general term for a type of outer garment worn over şalvar (trousers), whose length might cover the hips, reach to below the knees, or extend as far as the ankles. The examples in the Topkapı Palace collection are fitted to the neck, collarless, and open from the front; they widen from the waist downward, with the addition of triangular pieces at the sides and the front opening, cut with rounded protrusions at hip level. The side seams have vents to approximately twenty-five centimeters above the hem. As in other Ottoman garments, the sleeves are sewn to the body of the garment without a curved armhole. The pockets are pouches sewn to openings left in the side seams. The şalvar that were worn on the lower body consisted of the wide variety of forms. They could be narrow or wide, they could vary from knee length to ankle length. The lower legs could be wide or narrow, and the legs could be adjusted at the ankles with buttons. Another form of trousers (çakşır) had legs with soft leather slippers stitched to the feet. Şalvar were normally secured at the waist with waistbands that were embroidered at either end and passed through a five to ten centimeter seam stitched at the top of the trousers, gathering the top to fit. After the first half of the nineteenth century, during the process of Westernization, the şalvar underwent a period of transition in which they were belted like trousers, but the crotch was left wide as in the original şalvar and narrowed toward the lower leg. The clothing made of the gold-threaded fabrics with these motifs was worn by the sultans in their daily life as short or long kaftans over şalvar and a shirt or inner robe. On official occasions, a long-sleeved inner robe with sleeves that buttoned from elbow to wrist with adjustable cuffs would first be donned; over this were worn a short sleeved kaftan meticulously crafted of heavier silk, such as brocaded silk, velvet, or brocaded velvet, and then an outer, fur-lined, long-sleeved, full-length robe with buttons made of precious jewels. This sumptuous outer garment was known as a kapaniçe. There is mention of bands of be-jeweled frogged bands used as fastenings among a large number of kapaniçe listed in the treasury register dated 1680. There is also mention of a buttonless kapaniçe of a prince, which in general is similar in appearance to those of the sultans as portrayed in miniatures. Among other outer garments that are well known from various sources is the dolama, which can be one of three types depending on its cut. The first is a short, semi-fitted jacket, short-sleeved, collarless, and open in front. This description was given to a sırt dolaması in a note affixed to a jacket sent for adjustment or the tailor of Sultan Mahmud I (1730-1754). The other two types are known as divan and sipahi dolamaları, which have longer skirts, the first of which has a longer and wider skirt and sleeves. The ferace is another well known Ottoman outer garment that was worn by both men and women. Both local and foreign sources from the sixteenth century state that the ferace was a type of robe (cübbe), open in front with a wide body and sleeves. Its skirts were floor length, its neck opening was fitted around the throat (either rounded or in a slight V shape), and there were vertical slit pockets on either side of the front opening. The summer ferace were made of lightweight silk fabric, while the winter versions were of woolens (broadcloth) or mohair and lined with fur. The earliest types of headgear to complete the dress of the Ottoman sultans were woolen conical horasani. This type of headgear has been used by the Turks since very old times. A tall version of this headgear had long been part of the dress worn by Turkic women as well. During the reign of Murad I (1359-1389), a style of horasani was instituted that was generally called börk. It was made from a long, tubular piece of white felt, half of which was folded back and hung to the rear. When worn by the sultan and Janissaries, it was decorated and known as a üsküf. It is said to have been worn by Murad I during the conquests in Europe in the late fourteenth century. During the same period, the sultans wore the üsküf with a turban wrapped around it when they participated in meetings of the council of state. This style of headgear became known as the tac-ı sultani (sultanic headgear). During the reign of Mehmed II (1444-46, 1451-81), the royal headgear took a cylindrical form, around which fine muslin was wrapped. This new type of headgear was known as mücevveze. Sultan Selim I wore a headpiece that was named after him, selimi, which was somewhat longer than the mücevveze. Another type of headgear that is considered to be the invention of Süleyman the Magnificent is known as yusufi. It is the same height as the selimi, however, its crown was wider and fluted, and it was worn when the sultans were seated on the throne. The gold-trimmed börks made of felt, however, that were known as üsküf, continued to be worn in battle. The Ottoman Empire went under the influence of the West starting from the seventeenth century, which was a turning point for the Ottoman state’s fortunes in politics and economics. The West influenced the Ottoman world not only in the matters of technology, but also in those of the arts. The economic bottlenecks affected the textile industry as well as resulted in the deterioration of the quality of Ottoman cloth at the end of the century. One of the innovative movements toward Westernization of dress began during the reign of Sultan Mahmud II (1808-1839) in the Tanzimat (Reordering) period, in which the Ottoman state officially implemented reforms in order to open up to the West. It is noticeable that half of his garments were traditional, and the other half were in Western style. The Tanzimat period actually begins with Mahmud II’s abolition of the janissary corpses in 1826, and his institution of a new military body called Askir-i Mansure-i Muhammediyye (The Victorious Soldiers of Muhammed), which was Western in its organization as well as in its clothing. Westernization of military garment caused the Ottoman sultans to dress like Western commanders. Their uniforms consisted of suits of dark color, such as black and dark blue, pants with bands on the sides and jackets embroidered with yellow or white thread on the collars and wristbands. Instead of wearing turbans, the Ottoman sultans started to wear fez. Therefore, the Ottoman sultans looked very different after abandoning their four-centuries-long costumes. Halil İnalcık, Türkiye Tekstil Tarihi Üzerine Araştırmalar. Istanbul: Türkiye İş Bankası Kültür Yayınları, 2008. Hülya Tezcan, “The Sultanic Costumes in the Attire Collection at the Topkapı Palace Museum, Fashion at the Ottoman Court”, P magazine Fashion at the Ottoman Court, Issue 3 (Spring –Summer 2000), pp. 30-49. Hülya Tezcan, “Imperial Dress Preserved at the Topkapi Museum”, Berg Encyclopedia of World Dress and Fashion volume 5, Central and Southwest Asia. Oxford University Press, USA, 2010, pp. 139-147. Nurhan Atasoy, Walter B. Denny, Louise W. Mackie, and Hülya Tezcan, IPEK Imperial Ottoman Silks and Velvets. London: Azimuth Edition Limited, 2001. Nurhan Atasoy, Lale Uluç, Impressions of Ottoman Culture in Europe: 1453-1699. Istanbul: Armaggan publications, 2012. You can visit the TCF Image Archive on Turkish Art to see more images of Ottoman garments.